Reconstructing a medieval garden is part of the concerns of the modern man conscious of biodiversity, the environment and the balance of nature. 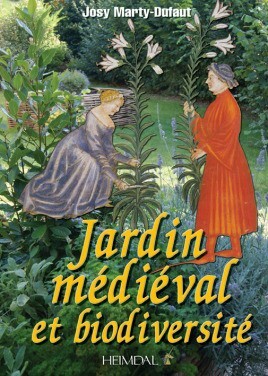 Reconstructing a medieval garden is part of the concerns of the modern man conscious of biodiversity, the environment and the balance of nature. Plant biodiversity is not confined to the maintenance of species currently cultivated, it consists of reintroducing plants formerly grown and long forgotten, as well as allowing plants, which are considered wild. The links between the environment control that are our gardens and the wild nature are necessary for the accomodation of helpful fauna. It was so in the gardens of yesteryear where vegetables, herbs and condiments, and flowers were close and mixed. The medieval garden is the epitome of early eco-gardening. In the Middle Ages, the work of the earth was a fight against hunger but, little by little, man discovered the pleasure of living in nature and expressed this in one of the most famous texts in French literature, The Novel of the Rose. The medieval garden, closed space, gradually becomes a place of delight. They cultivated the garden with love, ate vegetables that they grew themselves, decorated its interior with cut flowers and found a sort of lost paradise.